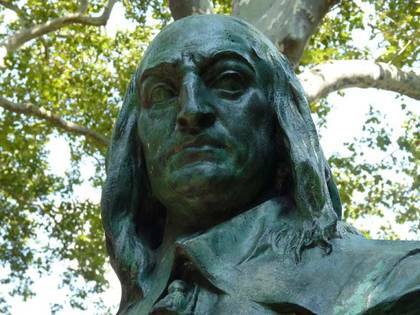 The legacy of Peter Stuyvesant. St. Mark’s In The Bowery, at 2nd Ave. and E. 10th St., is the oldest building on 2nd, dating to 1799, with additions in 1828 (the steeple) and 1858. Most of the church had to be rebuilt after a fire in 1978. 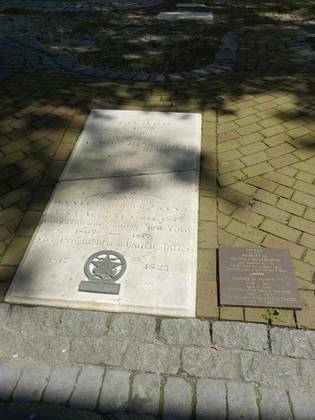 It stands on the chapel site of Peter Stuyvesant’s 17th-century estate (the Director-General of the New Amsterdam colony is interred in a vault in the churchyard, as his great-grandson sold the property to the Episcopal Church in 1793) and is turned to face Stuyvesant St., once the driveway to the estate. It’s claimed St. Mark’s is the oldest site of continuous worship in NYC. Its rectory around the corner on E. 11th St., designed by Ernest Flagg and completed in 1901, is the home of the Historic Districts Council and Greenwich Village Preservation Society, both major forces in neighborhood and historic buildings preservation, though only New York City’s Landmarks Preservation Commission is empowered to take a direct role in property preservation. Peter Stuyvesant’s country house sat roughly at 10th and Stuyvesant Sts., and in his era the Bowery was The Bowery Road, “Bowery” descended from a Dutch term meaning “farm.” The English word “bower” has the same etymology. The Stuyvesant estate extended from The Bowery Road east to Ave. C and between about 3rd and 13th Sts. Stuyvesant St. itself was, in the colonial era, the driveway to the Stuyvesant farm. It’s the only street in Manhattan oriented to due east and west. The Stuyvesant farmhouse burned down in 1778. Tompkinsville, Staten Island was founded by a future Vice President, Daniel D. Tompkins (1774-1825) in 1815, while he was the governor of New York. He established a ferry service to Manhattan in 1817, possibly from the landing mentioned above at Victory Blvd., and founded the Richmond Turnpike Company as an expedited means for wagons to travel to Philadelphia and elsewhere on the East Coast; the turnpike, called Arietta St. in Tompkinsville, was renamed Victory Blvd. after World War I. Tompkins was elected Vice President on the ticket with James Monroe in 1816, and served two terms. He died in Tompkinsville just three months after leaving office and is buried here in St. Mark’s Churchyard; nearby Tompkins Square Park also bears his name, as well as Tompkins Aves. in Staten Island and Bedford-Stuyvesant, Brooklyn. 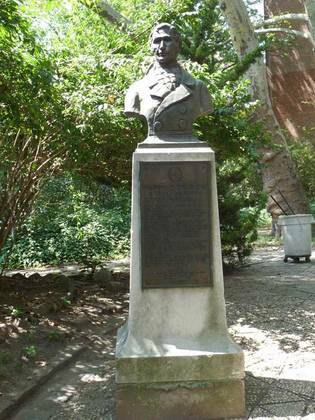 The bust of Daniel Tompkins in the west churchyard was sculpted by Oliver Grymes and given to the church in 1939 by the US Daughters of 1812, women's service organization for descendants of patriots who aided the American cause during the War of 1812. St. Mark’s Church stands on the site of the chapel built in 1660 by Peter Stuyvesant, the last governor, or Director-General, of Dutch New Amsterdam, and its grounds are all that remain of Stuyvesant’s vast “bouwerie,” or farm. Stuyvesant was interred in the family vault beneath the chapel when he died in 1672. During the 18th century, the chapel fell into a state of disrepair until little remained of it except its foundation and the family vaults underneath it. Stuyvesant’s great-grandson, Peter Stuyvesant IV, donated the chapel property to the Episcopal Church in 1793, and ordered that a new church should be erected on the property. St. Marks-in-the-Bowery was finished in 1799, making it one of Manhattan’s relatively few 18th-century structures. The Stuyvesant vault can still be seen at the church’s east wall under a stained glass window representing a pear tree that Peter Stuyvesant planed on his farm and lasted on 3rd Ave. for almost two centuries, long after the farm had been subdivided and a street grid had been built. 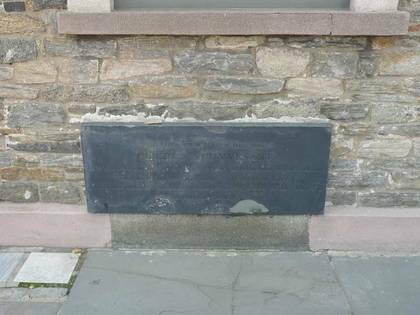 After the last Stuyvesant family member was interred here in 1953, it was permanently closed. Designed by Dutch sculptor Toon Depuis, the bust was presented to St. Mark’s by Queen Wilhelmina of Holland and the Dutch government on December 5, 1915. Elsewhere in front of St. Mark’s are two sculptures of Native Americans, “Inspiration” and “Aspiration” by Solon Borglum, brother of Gutzon Borglum, the sculptor of Mount Rushmore. They were acquired by Rector Norman William Guthrie in the 1920s. Guthrie began St. Marks’ long association with the arts that continues to this day. Two lion sculptures, acquired by Rev. Guthrie in the 1920s, stand guard outside the church doors. The lion is the symbol of St. Mark. The portico in front of the church was installed in 1858 and is the work of James Bogardus, the early proponent and builder of cast-iron front buildings, many of which are found in southern Manhattan. The wrought-iron fence was installed in 1838, while the steeple dates to 1828. The clock is relatively new and was installed after the 1978 fire. The St. Mark’s churchyard is home to a number of other interments beside Stuyvesant and Tompkins; early NYC mayor and famed diarist Philip Hone is here as well. There are no gravestones in the churchyard, though, as the interments are in vaults indicated by flat markers. 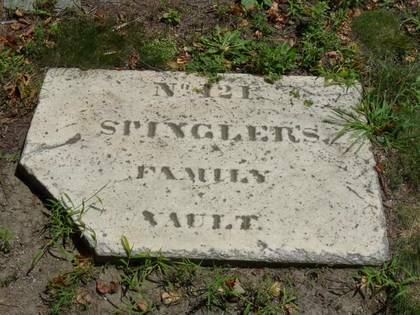 I happened upon the Spingler family vault, and research shows that German immigrant Christopher Henry Spingler (1747-1814) was employed as a butcher and shopkeeper, married three times, and dabbled enthusiastically in real estate, buying and selling properties all over southern Manhattan. Interestingly, his first wife, Jane Sloo Spingler (d. 1790) is buried in the churchyard at St. Paul’s Church, Broadway and Vesey St. 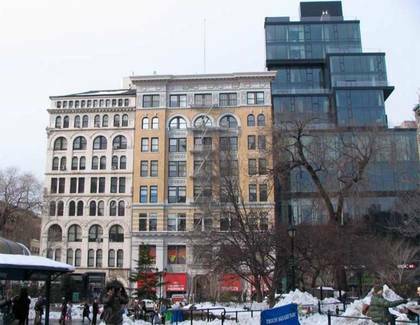 The center building here on Union Square West just north of W. 14th St., now a mixed-use residential and commercial building, bears Spingler’s name. The Spingler Institute for Young Ladies was built here in 1848 on land acquired from Christopher H. Spingler’s heirs, and after it moved uptown it was succeeded by the Spingler House Hotel in the same building until 1878. Two new buildings, both bearing the Spingler name, were constructed in 1878 and 1896; the first such building burned down in 1891. The otherwise-obscure Christopher H. Spingler’s name has been preserved in two disparate parts of town! This is Nicholas Fish-Elizabeth Stuyvesant House, 21 Stuyvesant St. As the historic plaque explains, it was constructed in 1804 by Petrus Stuyvesant, Peter’s great-great-grandson, as a gift for his daughter when she married Revolutionary War hero Nicholas Fish, who served with Washington at Valley Forge and at age 18 is still the youngest Major in US Army history. He was associated with Treasury Secretary Alexander Hamilton and the Marquis de Lafayette, whose military expertise helped win the war. Lafayette visited NYC in 1824 and was entertained in this building. Nicholas and Elizabeth’s son Hamilton Fish was born here in 1808. He went on to serve as a U.S. senator, governor of New York, and US Secretary of State under U.S. Grant. The Fish name has long been prominent in New York politics. Though this building may have the greater historical credentials, it’s not the oldest building on Stuyvesant St. 44 Stuyvesant was built in 1795 for Nicholas William Stuyvesant and is one of two remaining houses that belonged to the Stuyvesant family from the immediate post-Revolutionary era. 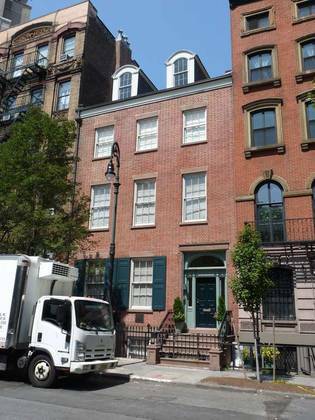 Only the Morris-Jumel Mansion in Sugar Hill is an older residential building on Manhattan Island.